Yes, quite a bit more. It is quite rare and it is a collector's item. Actually, they're yanking your chain. It's practically worthless. I'll give ya $5 for it! Seriously, it's rare, and you have yourself quite a find there. Most would keep her in a safe as an investment. If you're not the type to keep a safe queen, offer it up for sale or even to trade. You might be surprised what you're offered for a gem like that. Thank you for the information. I would sell it. If anyone is interested in it please let me know. 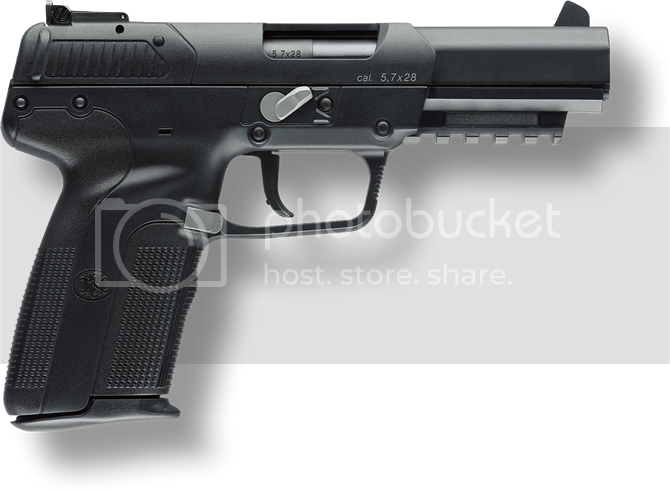 This is the most recent version of the Five-seveN. The USG keeps the features incorporated in the IOM, such as the magazine disconnect ("magazine safety"), single action trigger, and tall adjustable sights, but has some differences. These include a square (i.e. conventionally shaped) trigger-guard, checkered grip pattern, and a larger, reversible magazine release. There has been some confusion between the IOM and USG. Just remember once again that no matter what your user's documents call your Five-seveN, if it has the square trigger guard it is a USG. According to FN, the name mixup is due to the transition between the IOM and USG versions. USG pistols labeled "IOM" or "IOM USG" aren't any different than USG's labeled "USG". An average price for a USG is about $800. Max Gun Width................. 1.4 in. Max Grip Thickness........... 1.2 in. Max Grip Circumference.... 6.0 in. These specifications and dimensions apply to all of the Five-seveN variants currently available, with the exception of the trigger pull on the DAO Five-seveN variant being heavier at about 10-14 lbs. Please note that (despite the rumors going around) a Five-seveN compact variant is not being planned at this time. I am old. 56 and have CRS Big Time! Plus I don't understand a word you just said? found a usg with fixed sights at local gunshow this weekend but were'nt night sights.novak style but alot longer due to filling up the slide..looks good but pretty dumb idea considering how much point of impact difference there is at 25"with just the different fn ammo.not to mention ea or reloads.i would think fixed sights a bad idea unless shooting only one type of ammo and setting accordingly. DV8R wrote: found a usg with fixed sights at local gunshow this weekend but were'nt night sights.novak style but alot longer due to filling up the slide..looks good but pretty dumb idea considering how much point of impact difference there is at 25"with just the different fn ammo.not to mention ea or reloads.i would think fixed sights a bad idea unless shooting only one type of ammo and setting accordingly. I totally agree. Right On! I would start at Tanners. Anything but the USG starts to fall into collector territory and will cost more. This would be a FiveseveN pistol, manufactured in 2001 with the serial number 01001. Theory, not definitive fact, but it seems to fit. I do have a picture. New to this forum thing and not very computer saavy. How do I post it? Yours looks just like mine, but with some import marks on the barrel housing. The new "LOM" ladies version. Last edited by Powerstroke Racer on 26 Dec 2009, 17:09, edited 1 time in total. Maybe I'm a bit slow, but I thought you said the tactical model has a serial number starting with 3861. Mine starts that way but it has the rounded trigger guard instead. Did my tiny brain become over-loaded again? Tacticals do have a rounded trigger guard. But they also have a smooth accessory rail and trigger guard, meaning sans ribs or nibs or grooves what ever you want to call them. Also, an original tactical slide will have six dots on the grip at the back instead of grooves. Additionally the tactical should have a safety, and is usually black, as compared to grey on every subsequent model excluding FDE and ODG USG models. Furthermore, the pistol should not have a magazine safety, meaning the hammer should fall with trigger actuation when a magazine is not present in the magazine well. Mine has none of those features but does have the 3861 serial number that I thought it was said to indicate a tactical model. The photo below the tactical doesn't show a rounded trigger guard. I'll look again; Maybe I missed something.